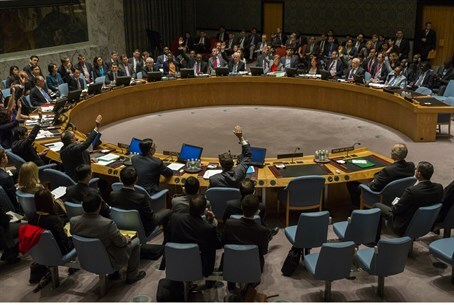 Britain, France and Germany put forward new UN Security Council resolution on Gaza in a fresh bid to end violence. Britain, France and Germany have put forward key points of a new UN Security Council resolution on Gaza in a fresh bid to end six weeks of violence, diplomats said Thursday, according to AFP. The European initiative came as fighting flared in the six-week war, with Israeli airstrikes killing three top Hamas commanders and an Egyptian-led effort to broker peace talks teetering on the verge of collapse. The two-page document obtained by AFP calls for an immediate and sustainable ceasefire that would put an end to the firing of rockets and military operations in Gaza. It calls for a lifting of the Israeli blockade and a monitoring mechanism to report on ceasefire violations and verify the flow of goods into Gaza. Diplomats said the measure was aimed at advancing efforts to reach agreement within the 15-member Security Council on a resolution after Jordan's draft met with resistance, notably from the United States. The points described in the "elements" document lay out the parameters for a ceasefire deal that would address Israel's security concerns and Palestinian Arab demands. It instructs UN Secretary-General Ban Ki-moon to immediately come up with proposals to "implement the relevant provisions of this resolution" in a move that could jump start the peace negotiations. UN diplomats said they hoped the initiative would shore up the Egyptian-led peace track and lead to a sustainable ceasefire to avoid a relapse into war in a few years. "We are getting positive messages from the region that this could be helpful," a diplomatic source told AFP. On Wednesday, the Security Council urged Israel and the Palestinian Arabs to return to the negotiating table to quickly agree on a lasting truce in Gaza. The 15-member council "offered full support to the Egyptian initiative and called upon the parties to resume negotiations to urgently reach a sustainable and lasting ceasefire."